For bowing and buckling concrete walls we use the Hold-Right® Wall Anchor System. This system can straighten and stabilize almost any bowing, buckling or bulging basement wall, improving and reinforcing the wall's structure. Replacing a bowed or buckled wall is expensive, but if caught in time, most walls can be re-aligned using this anchor system. 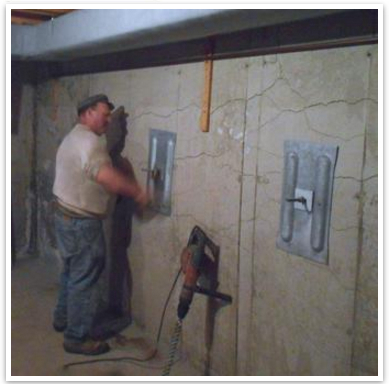 Stabilize basement foundation walls, retaining walls or any other kind of concrete pit wall. Wall anchors have been in use for over 70 years. You may have seen them used on highway guardrails, oil rigs and highline poles, etc. Hold-Right brand uses only high-quality steel and galvanized materials to meet the demands required to support walls. These anchors can be used in many types of soil conditions and have shown in stress testing that they meet and exceed normal use standards. 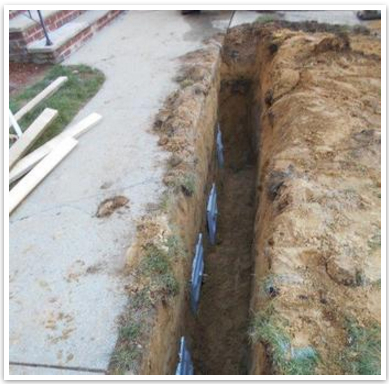 One Day Installation, Foundations, Retaining Walls, etc.